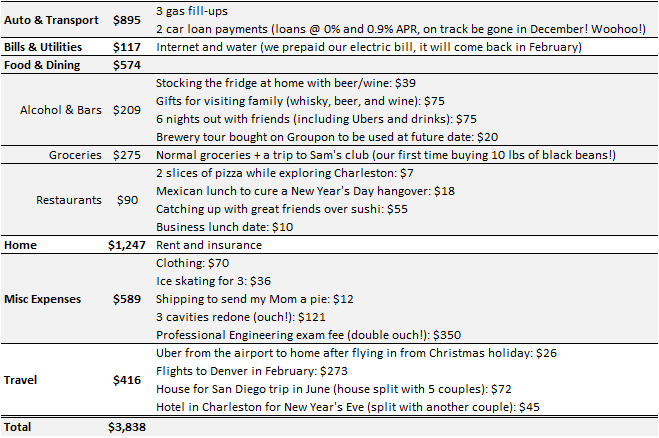 One of our goals for 2016 is to reduce our yearly expenses to $50,000 (~$10k less than last year – challenge accepted!). That means keeping our monthly expenses lower than $4,166. January was a pretty good month for us, especially considering we were traveling to see family and had a rowdy New Year’s Eve party in Charleston, SC. We came in just under our monthly budget with $328 to spare. The tough part about being away from home for over a month was we missed our friends! We were eager to catch up over some drinks at the bar (and had many game nights and fires at home where our boxed wine came in handy!). We did have one absolutely amazing free date night this month: attending the world premiere of 13 hours: The Secret Soldiers of Benghazi. A once in a lifetime experience and another item crossed off the life to-do list. Overall, a great start to the year! Next month will be filled with travel! We have a Denver ski trip and are already planning to keep costs on the low side by staying at a friend’s cabin, buying groceries for the weekend, and getting discounted ski passes. We are also going down to San Antonio to see an old friend from college. Luckily while we are gone we are renting our place out on Airbnb which should cover the cost of the Denver and San Antonio trip!